Capsicum Stir Fry, this dish is very simple to make. When you do not have enough time to cook and if you want to cook something really quick, this dish will be a best option. Ingredients used in this dish will be pretty much available in your kitchen. You can make this dish in 15 minutes. I have read that Capsicum is very good for our health and it has antioxidant properties. So it is good to include in our day to day cooking. 1. Chop the capsicum into medium sized pieces. Keep other ingredients ready. 2. Heat oil in a kadai and add the chopped capsicum. 3. Give it a stir and add red chili powder, turmeric powder, coriander powder and salt. Mix it well. 4. Cook on medium flame with lid closed till the capsicum is fully cooked. No need to add water. Once done, switch off the flame. 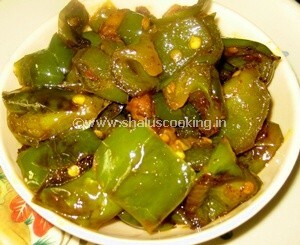 Capsicum Stir Fry is ready to serve with Chapati or Roti. This will taste good even with plain steamed rice. You can mix with rice and enjoy it.